Submitted by FretSpider22 on Wed, 06/18/2008 - 09:17. Im about to do the wiring in my Jackson Js1. New volume and tone pots, I ordered a new 3 way blade style switch but its a little different. The contacts to solder to are on the side. On the old switch the contacts are in a row on the bottom of the switch and was hoping someone could help me out wiring this up with this switch. In this picture, The switch on the right is the new one. you can see the old switch on the left has the contacts to solder to on the BOTTOM of the switch, and on the new switch u can see the contacts on the side. 3 on each side and 1 in the middle so i need to know how to wire this into a Jackson Js1 with 2 humbuckers,1 volume,1 tone and the 3 way blade switch. Please help me! this is my only hold up. Posted by 1bassleft on Wed, 06/18/2008 - 23:21. Sorry for such a quick reply, but it's late here. 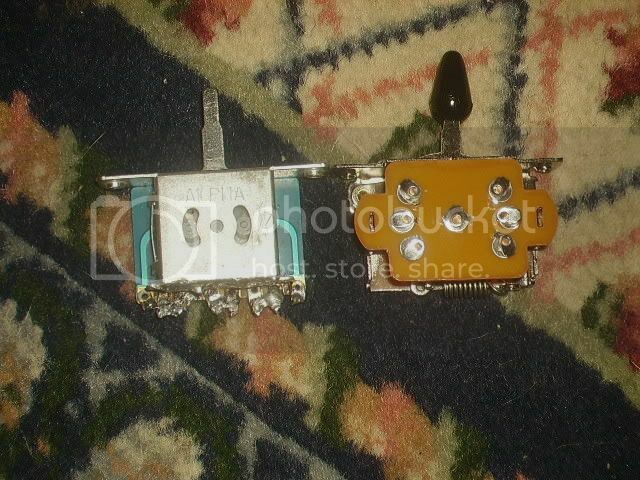 Have a look at the excellent guitarelectronics.com site for all manner of wiring diagrams. If that doesn't help you, please call back in and I'll try to help a bit more. Posted by FretSpider22 on Wed, 06/18/2008 - 23:49. The new switch is on the right and u can see the contacts clearly. and on the left switch the contacts to solder to are on the bottom. So i need a JS1 wiring diagram but figure out how to use the switch i got.